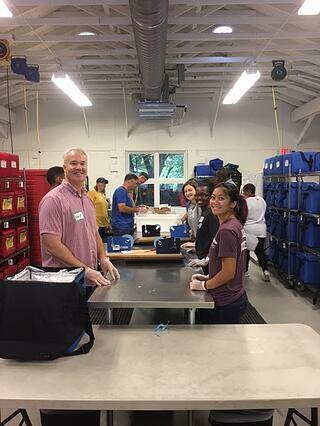 On Friday, August 18th, the AgBiome Philanthropy group teamed up to help pack and deliver food to Durham residents through the Meals on Wheels program. The morning started with receiving food from one of the Meals on Wheels caterers, which was placed into warming ovens to keep the food hot. While our group was waiting on route drivers, we packed to cold items including milk, fruit, and bread into separate serving bags for delivery. 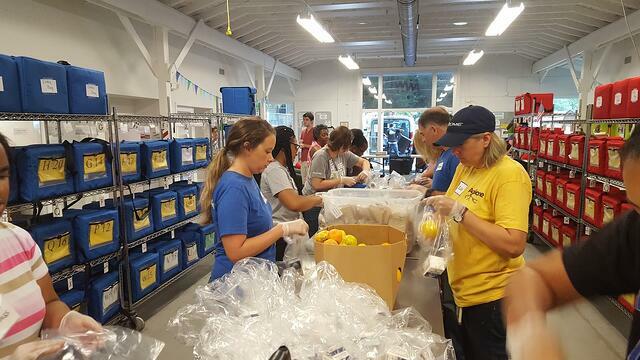 In no time, we had several hundred meals ready to go to homes around Durham. The process was easy, except for trouble using the bag sealer at the end of the assembly line. We could not get the motions right! Two AgBiomers, Jill Paulik and Esther Gachango, volunteered to drive a delivery route and meet some of the people Meals on Wheels helps to feed every day. We all were surprised to learn that for some people, this program provides almost 100% of their calories. We were grateful to be a small part of the Meals on Wheels program, and we look forward to helping pack and deliver more food to the community in the future. If you would like to help support Meals on Wheels, please visit their website to learn more, www.mowdurham.org. There are multiple ways to give and volunteer, and you’ll be surprised at how easy it is to drive a delivery route, which is one of their greatest needs!